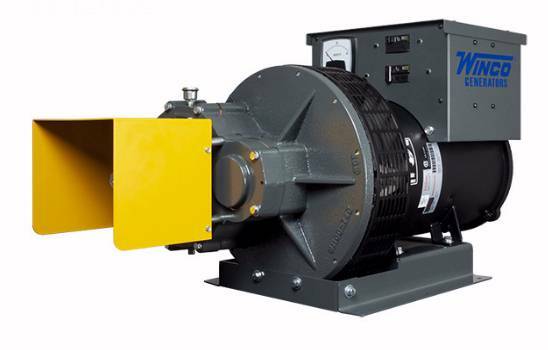 Winco Tractor Driven Alternators provide electrical power for a variety of farm or remote location electrical systems and equipment. Winco has been providing quality standby electrical systems for worldwide use since 1927. Ruggedly built for truly dependable emergency standby and portable power, Winco has several models to choose from - single and three phase models with self regulation which automatically adjusts voltage to match the load. AC, 4-pole revolving armature, statically excited and regulated. Drip proof control box. External grounding lug. Generator rotates at a slow 1800RPM for longer life. Three year warranty covers entire alternator against defects in material and workmanship under normal use and service. After 1 year, factory repair and reconditioning service is available at cost of labor within 3 years of purchase date. Detailed warranty certificate enclosed with each alternator; sample copy available upon request. * pto shaft is fully guarded for safety. generator operation. Heavy 10 gauge deck allows room for accessories or tool box. * A lower PTO shaft hp rating is acceptable but electrical output will be proportionally less. sites in Canada. But it is normally acceptable for residential and farm use.. Pick option using dropdown menu before pressing button. This item ships with free ground freight to the USA 48 states.